Dwell by Cheryl: "My First Estate Sale"
Thanks so much for all of the positive feedback on the sofa makeover. I'm really loving it and so glad that I went the direction that I did. Mark left a great comment yesterday that I thought I'd share. I'm sure most people don't go back and read comments on past posts, so you may have missed it. He said, "Most cases, with the right 'sale' on fabric, and labor cost for reupholstery, you can easily stay under a grand, much less if you bargain shop the fabric! That is basically custom made to order, the way you want it. There really aren't a lot of restrictions like what you have at the furniture store." Mark really is talented at his craft. He's had some Facebook challenges lately, so much of his past work is not posted yet, but you should "Like" his page to see what he's working on now. In other news, I had a great weekend. 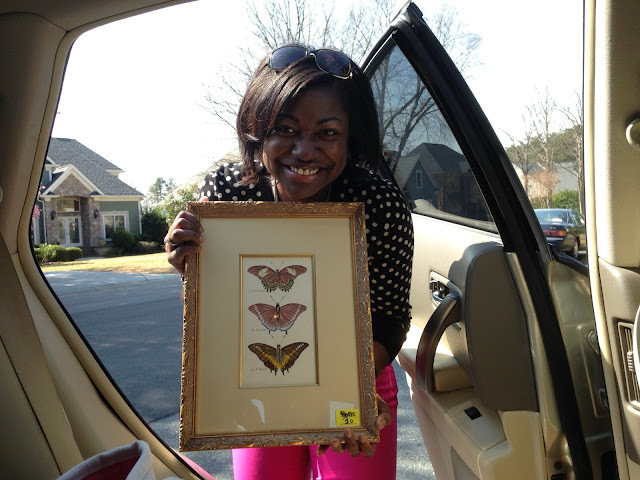 Jennifer, of Pure and Simple Organizing, and I went to our first estate sale. There were tons of deals to be had. Honestly, I was a little disappointed that we missed the first day and had doubts that any of the good stuff would be left. Boy was I wrong. In fact, I'm glad it was the second (and last) day of the sale, because the sellers were willing to make some great deals. There was quite a bit of furniture remaining, most at 50% off and there was also lots of art. Unfortunately, these silhouettes weren't for sale (indicated by the pink dot). Too bad, because they would've been perfect in a kids room. Well, it was an estate sale, not a thrift store, so the prices were reasonable but not exactly dirt cheap. Nevertheless, we managed to find a few deals. Like this vintage key door knocker for $5.00. I'm not sure if I'm going to keep it or sell it, but I thought it was cool. The homeowner was an artist so there was loads of art supplies and books. I picked up these two for $1.00/each because I thought the prints inside would make great (and inexpensive) art. I was right! I made this with a page from the Vintage Gardens book and a $2.99 Goodwill frame/matte. Popped out the existing art inside and added a page from the estate sale book and there you have it. And, I know it's a little random but I also picked up two pair of $5.00 Talbots Corduroy pants. I'm in a colored cords phase right now, so for $5/each, I couldn't pass up these in pink and purple. Apparently, the homeowner was a BIG fan of Talbots. Fine by me! However, my deal of the day were these framed and matted butterfly prints. I got them for $10 each although they were marked $20 each. I LOVE THEM. Needless to say, it didn't take long for them to find a home in my living room. They pretty much had me at gold trimmed matte and frame. I think Jennifer and I both agreed that the whole Estate Sale thing was a must for the future. Now that I know what to expect, I'll be armed for our next venture. I'm still kicking myself for not buying more at the estate sale. Some stuff was really different! And that Goodwill frame/photo book project!? LOVE it! We did Whitley! Jennifer, I'm ready when you are. I know, the $10 stool is haunting me.